tvN’s latest 24-hour express drama in Asia – Player (玩家) – starring the hottest stars, award-winning actor Song Seung-heon (宋承宪) and singer-actress Krystal (郑秀晶), will premiere exclusively on tvN in Singapore, Malaysia and Indonesia from 30 September (Every Sunday & Monday) at 21:45 (GMT+8). With the big success of express dramas like What’s Wrong With Secretary Kim and Familiar Wife, tvN expects that Player will continue to impress audience with its “thrilling” and “emotional” elements. Player follows the story among four talented outlaws, i.e “players”, that rob the proceeds of crime and return to the poor. The team consists of veteran conman Kang Ha-ri (Song Seung-heon); skilled driver Cha Ah-ryung (Krystal); professional hacker Im Byung-min (Lee Si-eon); and inborn fighter Do Jin-woong (Tae Won-suk). Different from typical action dramas which stand on the viewpoint of the police or detectives, Player depicts a riveting story from the angle of swindlers, who are simply ordinary, or you may say not-really-rightful characters. This certainly draws keen attention to the fates of the crew as the story unfolds. Likewise, Krystal’s first appearance on an action drama apparently grabs the audience’s attention. Krystal has expressed her feeling on her first challenge, “I always want to take part in an action drama. Although numerous action scenes in Player require lots of training and practice, other actors and the director are really experienced and caring, so I am well taken care of. The whole filming was exciting and enjoyable.” It is revealed that Krystal will take part in many car chasing scenes, which transform her from an elegant pretty lady from previous roles to a “girl crush” fearless driver! When four people with different background and distinct character join forces, what kind of thrilling story will happen on them? Stay tuned to watch out the perfect chemistry of this “Gang of Four”! 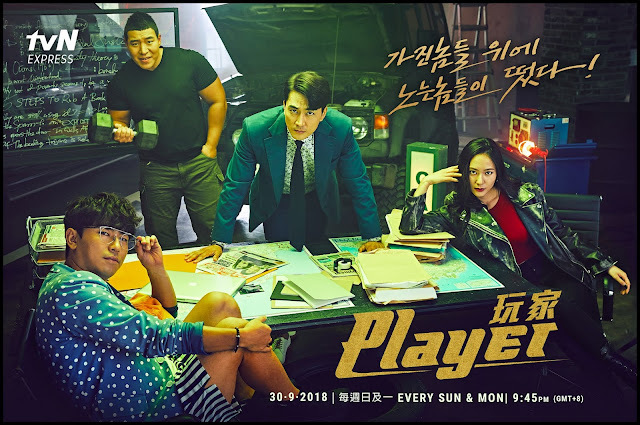 Player will broadcast on tvN in Singapore, Malaysia and Indonesia from 30 September (Every Sunday & Monday) at 21:45 (GMT+8), within 24 hours after its broadcast in Korea, with subtitles in English, Chinese, Bahasa Malaysia and Bahasa Indonesia.